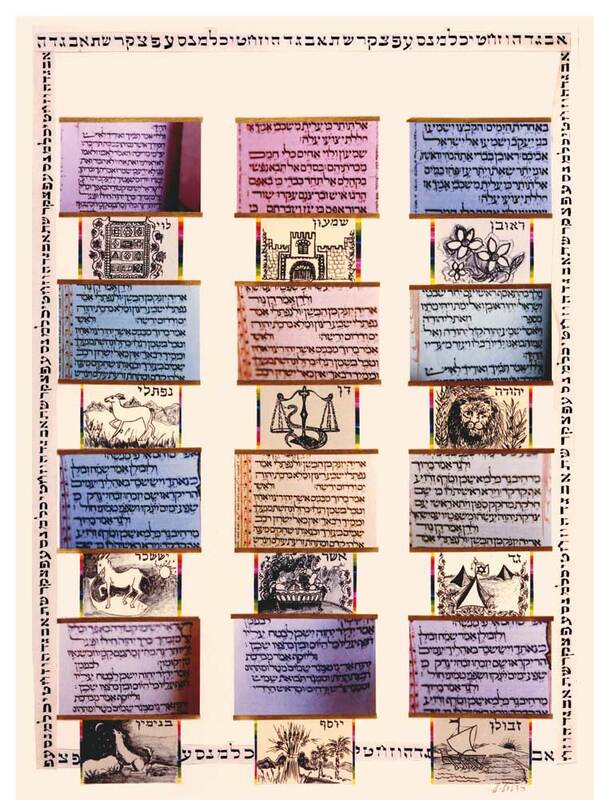 This panel combines the traditional symbols of the twelve tribes of Israel, passed down through many generations in Judaica art from synagogues and other sites, with photographs of the text of the relevant passage relating to the twelve sons on Jacob in Genesis 49 or to the twelve tribes in Deuteronomy 33. The photographs were taken of a rare Bible from Spain found in the National Library in Jerusalem. The border element spanning the four sides of the panel is the Hebrew alphabet (or aleph bet) written in scribal lettering on strips of parchment. Size: 28 x 19 in.